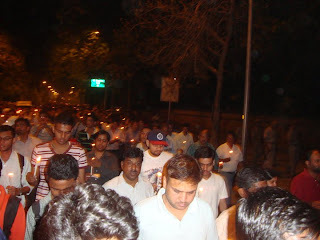 Day-3 of Anna's fast and after last evenings successful candle light march I woke up feeling great. Doing good things does that to you. Unlike my regular routine of grabbing the newspaper the first thing I did this morning was to toast four slices of bread for my self. Well, being without solid food for two days at a go does make you realize the importance of food. After paying my broadband bill I rushed to Jantar-Mantar and like the previous two days distributed pamphlets in the metro. Quite a few people seemed interested in what was going on. Some asked me questions regarding Jan Lokpal and I tried my best to clear their doubts and reservations about Janlokpal and the ongoing event. Many of them pledged their support to the cause. I finally reached Jantar Mantar at half past eleven and got busy with managing the crowd. The crowd that day was much more than the previous two days and the volunteers like me were having a tough time managing it but we were enjoying it at the same time. Then I met a group of engineering students from Greater Noida who had come all the way to support the cause and given that they were my university juniors I joined them and we did a flag march in the inner circle of Cannaut Place. We shouted slogans, waved the Indian flag and distributed pamphlets. The public response was great and raised our morale. We came back to Jantar Mantar by 4pm by which the preparations for the candle march had started. I joined others in the preparations and by five thirty after another stimulating speech by Anna we left for India Gate. The mere sight of thousands walking quietly with candles in hand would have shook the political leaders sitting in north and south block across the road. It wasn't Tahrir Square as some people put it, it was more awe inspiring than Tahrir Square. In Egypt there were gun shots and killings but here, in India we followed the words of Mahatma Gandhi and like a true Gandhian did not resort to violence or damage to public property in any way. Silence is more powerful than shouts. I had heard that, now I believe that. We came back to Jantar Mantar by 7:30 and the march consisted of more than ten thousand people. None of them paid or brought there in trucks, they all were present there because they wanted to help in the cause. After coming back a went back to my crowd management duty. An assamese friend of mine also came to Jantar Mantar after her office. It was her first experience of such an event and to be true it was a bit unpleasant for her as she hates crowds. Despite that she agreed to the fact that this was indeed an unexpected mass of humans. She had come expecting a few hundred people but what she saw was thousands and thousands with candles in their hands and marching silently. At around nine in night I went to the help desk as I was thirsty and needed a glass of water. There I met Prahlad, a volunteer who is known by everyone associated with IAC to be proactive and passionate about the cause. Prahlad bhai asked me if I would volunteer to stay in the Ram Manohar Lohia (RML) hospital with the three patients who had been sent there from among those who were fasting due to dehydration. I was a bit reluctant in the start and tried my best to find others for the job but everyone said, "I can do it tomorrow but not tonight." Thus in the end I took the responsibility. I walked my friend to the nearby Patel Chowk metro station and then went to the hospital with another volunteer called Manoj. There we met Yogesh, Ramashray and Sneha who had been performing the duty of looking after the patients till now. They stayed on for a while, introduced us to the three elderly people who were admitted and briefed us about the medicines and blood reports, etc. A few media persons also came and informed us that a few other anshankari's were unwell and they might be brought to RML. I and Ramashray went and talked to the lady on reception about availability of beds and were told, "There are no more beds, the best we can do is to put two of you patients on one bed." It angered all of us but we decided not to take the matter any further till any more patients arrive. Thankfully no more patients arrived that night. Yogesh, Ramashray and Sneha left at about 11 in night for Jantar Mantar where they were supposed to spend the night. I and Manoj sat by the three patients, namely O.S. 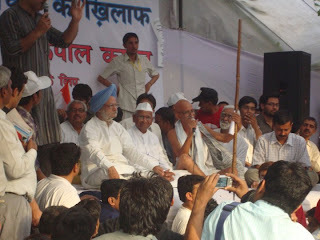 Chauhan, Rampal Singh and Mahant Gopaldas. 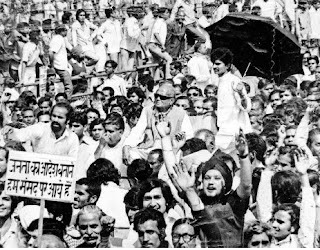 Chauhan saab was a 74 year old ex-government servant who had come from Bhopal to take part in the agitation, Rampal Singh was from Etawah in U.P. and Gopaldas ji was Mahant of a temple somewhere near Bhopal. He had undertaken such fasts earlier too but this time had decided to do it without water and during regular checkup the doctors found that he had fever and brought him to the hospital. What followed was an hour long discussion on whether or not the corruption in India can be rooted out, whether Anna's fast was morally correct, whether the Government will relent or not. After an hour when Manoj came out for a stroll he saw me in middle of a heated discussion and said, "I thought you were tired and wanted to sleep." I didn't reply, just grinned and continued with the discussion. Manoj also joined the discussion and after a while I went to sleep at about 4 am. On the evening of 4th April I was contemplating whether or not I should go to Jantar Mantar the next day. All my immediate friends had declined as they thought it was a waste of time and that had forced me to question my decision to go. Then at about 7:30 pm I received a call from Pranjal, an acquaintance whom I had't met for past six-seven years asking if I would go with him. I said yes without hesitation and today I feel proud of my decision. On the morning of 5th April I met Pranjal at Rajiv Chowk metro station and though as per th schedule I was late by half an hour but knowing that this is India I was comfortable. We took an auto to Jantar Mantar and got down at the red light. There we met two more youngsters of our age group and joined them. They were Ankit Kakkad and Abhishek Aluria. We reached Jantar Mantar road and found pandals and stage but not many people were there, not the thousands that I expected at least. There was an information desk on which there were pamphlets about Anna and Jan lokpal bill. There I also saw Swati Maliwal and Gaurav Bakshi, two people whom I had seen in an online video telling people about Jan lokpal bill and Indian Against Corruption, an NGO which they were a part of. I went over to Swati and told her that I would be available in case she needs a volunteer for anything and also met Gaurav and told him that the online video of him interacting with students was one of the prime reasons I was at Jantar Mantar. Another half an hour passed and I had nothing to do apart from roaming around. Anna was on the way from India Gate after visiting Raj ghat and the crowd had still not swelled beyond manageable proportions though surprisingly there were no police men in great numbers as there are in many such events. A few but helpful ones were there though. After I while when no body gave me any work I decided to find work for myself and started to distribute the pamphlets about Anna Hazare and Jan lokpal to the public. Interestingly most of the people there didn't know what Jan lokpal was about and asked me. Even I didn't know the answer! So I sat down and read the pamphlet myself first. Only after I understood what the bill was about did I start to distribute it again, this time also explaining it to the people who asked me about it. Anna reached Jantar Mantar at about 11:30 am in an open army jeep with Kiran Bedi, Arvind Kejriwal, Swami Agnivesh, a group of bikers, a few cyclists and a large crowd walking behind him. There might have been somewhere around a thousand people in that crowd which came along with Anna and Anna was escorted to the stage directly. At this time I was standing with a sardar who I had just become friends with. His name was Tejindar and he belonged to BJP and is part of it's youth wing but was there in personal capacity. On the stage Kiran ma'am announced that the fast has started and that Anna will not move from Jantar Mantar until the government accepts to the demand of accepting the proposal of Jan lokpal bill. After that Arvind Kejriwal, Swami Agnivesh and many other people gave speeches. Famous Hindi poet, Dr. Kumar Vishwas anchored the event and kept the crowd entertained with his one-liners. Anna also gave a speech and talked about the current system, the need of change and how the youth need to come forward. He also talked about his past and gave us a brief introduction of his work in Maharashtra and the army. Anna also talked about how at one point of his life he was contemplating suicide and then he pledged his life to serve the people. His speech literally shook me. A 73 year man, going on fast-unto-death for his country and here I was, a twenty seven year young man, distributing pamphlets. I can do better than this, I said to my self. I thought over the options I had. First and most visible option was to sit on fast-unto-death with Anna. I weighted the pro's and con's and in the end decided against it as knowing myself I knew I won't be able to sit idle for long which was something all the anshankari's were required to do. The second option was to keep distributing pamphlets like I was but by doing that I was not doing justice with my own abilities, so I decided to look for further options. Then I heard someone talking about a kramik anshan. Kramik means cyclic. So it was like you observe a two day fast, then after five days you again observe a two day fast if Anna is still on fast. So I got myself registered for kramik and at the same time continued with pamphlet distribution. By five thirty in the evening the crowd started to swell and from six o' clock the sarv-dharm prarthna sabha started. Nitin Dawar, a member of 'The art of living' sang his now famous Jan Lokpal song which became a national anthem for the people demanding Jan Lokpal. Many other songs were sung, prayers were made to the almighty and then there were patriotic songs. That evening on Jantar Mantar I witnessed one of the rare occasions when people from different strata of the society, irrespective of caste, creed and regional identity danced to 'Rang de basatni chola' and sang 'Raghupati raghav raja ram' along with the singer. When a singer sang 'Ae mere watan ke logon' the crowd was mostly silent but their eyes were filled with water. Apart from a cricket match and 15th Aug or 26 Jan I had never seen such zeal. It struck a chord with me and I along with the friends I had made in the morning, Ankit and Abhishek, danced till 8pm. At 8pm Sri Sri Ravishankar ji addressed the crowd on web conferencing from Germany and pledged full support to Anna. All of us left Jantar Mantar at about 9:30pm with the conviction of returning the next day. All of us picked some pamphlets and decided to give them to people on road and in metro. After bidding adieu to my friends at Rajiv Chowk I got on a metro to Anand Vihar which is about a mile or so from my home in Vaishali. In the metro I gave pamphlets to a few people but most of them looked at it with dis-interest and then folded it and kept it in their pocket. A few even told me that what I was doing was useless and India cannot be rid of corruption. All I replied was, 'Let's try at least.' Their words only strengthened my conviction and support for Anna's cause. Now it was no longer only Anna's cause, it was my cause too. I reached home with severe ache in the leg but with a happy heart. That was how my first day under the auspices of Anna came to an end.